Remember that follow up post I promised? Well, it's super late! It's the new year now and I'm hoping to be able to bring you all some more amazing things. Not only am I writing up these posts about how I crafted myself a Monk costume, but I've got one more completed cosplay on its way to you! On top of that, I've got some more in the works! I'll be posting my convention schedule for the year in a a few posts, so keep an eye out for it! I would love to see you all there. But let's get to the good stuff. 1. The sleeveless, vest-like top. 2. The capri, cut-off pants. Knowing this, I wanted to find patterns that would allow me to make the base, and customize it. The trickiest part was finding a top. Not only was it a sleeveless top, but, there were no zippers or buttons - instead there were toggles. I knew the toggles certainly weren't going to hold this costume together, so I needed to fake it. Although the top has buttons, I marked some designs on the pattern where I thought I could sew in an invisible zipper, and somehow attach the toggles on top and make it appear like they were holding everything together. So this would have to do! This is easily the most difficult stage in my opinion. Reading and figuring out patterns is such a pain! In my years of sewing, I've come to like Simplicity's patterns quite a bit. But, they don't always have what I need. This New Look brand really wasn't my favorite, as you'll see in some of the photos later. But my first step is to always read over the pattern ENTIRELY before you cut or do anything. This will help you figure out if you can save yourself any time, or prepare your fabric in a certain way. Then I lay out my fabric and begin placing the pattern. I try to maximize space the best I can so that I can save fabric for if I screw up. I typically buy an extra yard (depending on what I'm making) in case I goof up, or need to patch/repair something later. After laying out the pattern pieces, I pin them down. Sometimes I place large books or magazines on the pinned pattern to help keep it flat during this process. I find it helps a lot. Placing all of the pattern pieces. Some pattern pieces need to face a certain way, or lie against a fold - this is something that you'll find in the directions of your pattern. Always double, or triple check this. I can't tell you how many times I've cut something only to find I had the pattern laying backwards on the fabric. Once you're done pinning - Cut away! Once my least favorite part is out of the way, I finally get to get to the good stuff. I like figuring out how to contort my body and fabric in odd directions in order to ensure my lines are perfectly straight and smooth. But that's just me. Even after we just spent a long time pinning the pattern to the fabric, we get to do more pinning! If you've made it this far and haven't stabbed yourself yet - major props, you must be a ninja. I'll have to keep track of how many times I bleed on my fabric during my next project. Anyway, I'll spend a good portion of my time pinning, then sewing, then pinning, then sewing. Much of this stage is a back and forth. But I like to do it all in chunks - I'll try to finish one area, and then move on to the next. Generally I follow the directions of the pattern. But a lot of the time I'm altering it - making changes, adding things, adjusting the collar, etc. So I pin and then hold it up in front of the mirror and do a quick check. Pretty sure almost every cosplay project I've done has required sewing darts. I think it's a great challenge to start out with, as you've gotta sew in a straight line without much guidance, AND ensure you don't get any bubbles. Try practicing on scrap fabric if you don't know what I mean. It's a great exercise. But this was how I started out with my Monk costume. I fitted the collar and then began creating the darts on the front and back pieces of the vest (pictured above). During this project I also got to teach two of my friends how to sew! These lovey ladies were my two other monkstateers (hehe, get it?). I had them help me with some of the more basic stuff to get practice, such as adding the grey trim around the bottom and inner area of the vest - or making clean edges for any extra areas that might show. I focused on making sure the costumes were functional, ie. could be worn, would actually go on and stay on during the premiere, and endure the strength of our mighty poses. Me working on the trim - hello there! One of the greatest things I've learned over the course of my cosplay career is that it is okay to sometimes cut corners. We were close for time with this project, and considering I was doing the major work on 3 costumes, I didn't have a whole lot of time to spare. So instead of sealing the trim on the inside of the vest, I used this magical miracle glue that was a gift from god. It's this great stuff that you can find at any craft store that comes in several sizes. Where I fused the seam on the inner-part of the vest. It's like a glue ribbon that you lay down on your fabric, and then place another piece of fabric on top. Once you've got it all in place, you smooth it over with your iron for a few seconds, fusing the two pieces of fabric together with the glue. Once it cools, they stick! It's a great way to: seal edges, attach things that you don't want to have stitch marks, and more! The only con is that it's not the strongest thing in the world. So DON'T make your whole costume with this. After we finished making the vest, which basically consisted of a back piece, two front pieces, trim on the bottom, center, and sleeves, and a zipper, we were done! The rest of the vest would be taken care of with accessories. I then moved on to pants. This was my first time seriously making pants. Previously I altered two pairs of pants for Roxas (so there was some sewing involved) but not from scratch. This was a serious trial! I'll be honest with you all now: it wasn't as bad as I thought it was. There were four pieces total. Two combined in the inner-thigh, and were then connected to the other pair at the outer thigh. Seems super simple, right? For the most part, it was. Our pattern was super wonky, which is where you can queue my complaints about new look. But, once you've got a basic pair of pants pinned, you can altern them to fit. My recommendation: make a size or two larger than you are, and then alter it down. The worst thing you can do is make a pair too small and then you have to start from scratch. 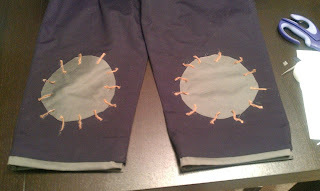 The rest of the pants were easy - I added the grey trim on the inner part of the pant so the seam didn't show. I used a side zipper for the pant so it was easy to alter/adjust the size. Then there were the paw prints. 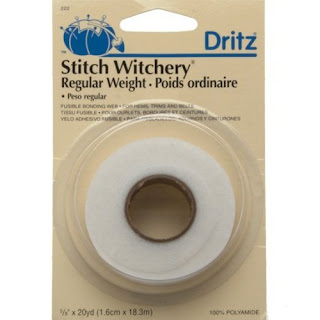 I just cut out a basic grey circle and fused it on with the stitch witchery mentioned above. After that, I cut out small pieces of yarn/twine I picked up on sale at Joanns. I fused that on as well (although I will mention this did get goo all over my iron - I just cleaned it later). To finish, I used fabric paint to do the paw designs. That about concludes the sewing portion of the Monk costume! It's super straight forward and easy to make. The biggest challenge was getting everything to fit well, as all of the characters costumes are quite snug. In the next post I'll be covering accessories (and my prop) and then will put up a final post on how I brought it all together to turn myself into a Panda! Thanks for reading everyone! Let me know if you have any questions. Looking forward to writing again soon. Hello! What exact colour of fabric did you use? And where did you get it? Thanks! Hi there! I found a nice black cotton fabric that was light-weight, but strong. I get almost all of my fabric from a local store, Joanns, but they have an online site, too. :] I found the silver fabric there as well, although I believe it was a cotton with a more sateen finish. Hey there! I picked up the pattern on sale at Joanns, but the pattern is also available on several websites. I would recommend purchasing it here: http://www.simplicity.com/p-5141-misses-separates.aspx . Simplicity is one of my favorite brands for patterns, and I liked this one a lot!